Winter is upon us! And the Blue Boar Bar at the Conrad St. James has released a menu of 4 winter cocktails to enjoy along with their Christmas Bites food menu. The sprawling Blue Boar rings with Xmas music across a gorgeous wooden bar, deep blue surrounds and quirky musical-instruments-turned-lamps decor. It might seem crowded on a weekend, but there is more space and privacy than there is at first glance. 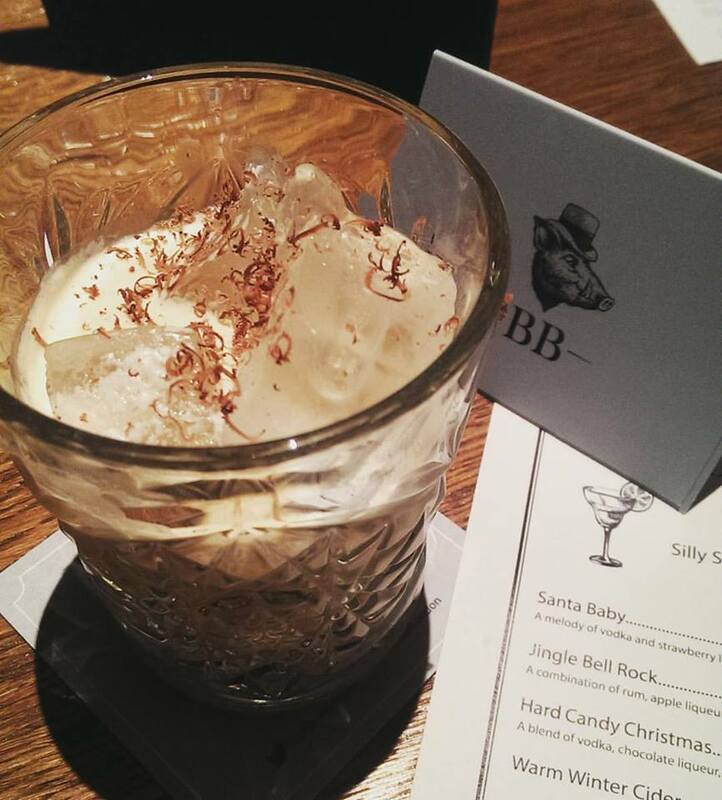 The limited edition Winter Cocktails take a turn for the sweet, but the Jingle Bell Rock is great for something just a bit sweet without needing a dentist. A combo of Havana 7 Rum, apple liqueur, cinnamon syrup, splash of blackberry puree create a cold cocktail where the vanilla and honey of the rum and blackberries dominate the palate, with the cinnamon dancing gleefully in the background without taking over the drink. A spicy-sweet apple finish to a well-balanced drink where the flavours marry rather well. Probably the best on the Winter cocktail menu! The Santa Baby brings together vodka, strawberry liqueur and a dash of cream to create what is essentially a spiked strawberry milkshake! Chilly, with a fun glitter rim, the sweet creamy cocktail is fairly sneaky in terms of alcohol, but is rather thick. 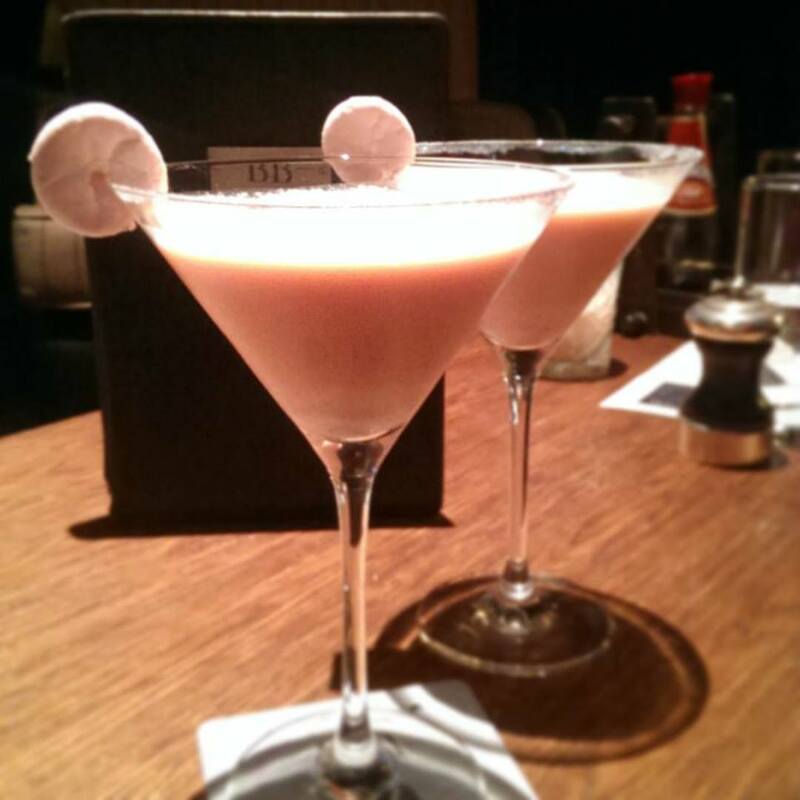 Though a friend was downing these pretty quickly, I myself ran only about halfway through before realising it was dessert – this will determine who on the table has a sweet tooth! A batch of truffle chips for something savoury and salty before moving on to the third cocktail: the Hard Candy Christmas – vodka, chocolate liqueur, Disaronno amaretto, double cream. Personally, this one doesn’t quite work. The first sip is a punch in the face with chocolate liqueur, thick, before ending with slightly overpowering amaretto. The brand of liqueurs has that faux-chocolate flavouring to it which I myself found to be bit a of a turn-off – but hey, there must be someone we all know who’d enjoy it! I feel when put up against the rest of the menu, it is lacking. Finally, ending with a simple Warm Winter Cider (at a fab 4 pounds! ), a hot, slightly spiced and citrus cider to warm the bones before braving the cold outside again. 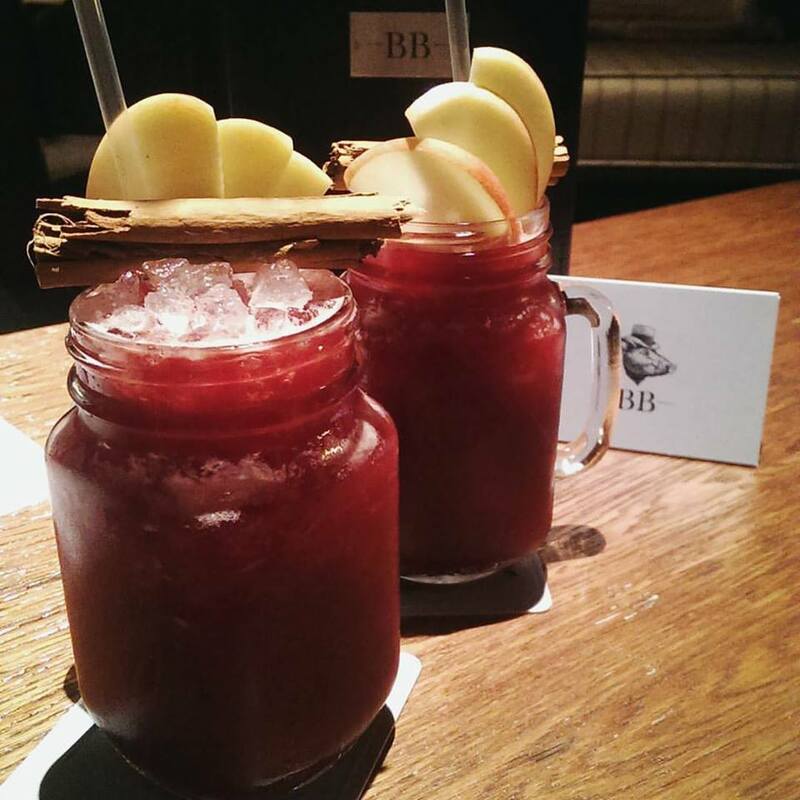 Service at the Blue Boar is fantastic, always swift, polite, and you don’t really have to worry about being checked up on – making it a discreet getaway during the winter season for an xmassy cocktail – and plus points if you hide yourself away in the private room to cosy up these winter months. This entry was posted in Bars & Cocktails, Festivals & Events and tagged Christmas, Hotel, Large Groups, Small Groups, Winter.